Lavey and Eoghan Rua will meet in the Derry Senior Football final on October 21st. Eoghan Rua of Coleraine will meet Lavey in the Derry Senior Football Championship final on Sunday, October 21st after both had relatively comfortable semi-final victories in Owenbeg on Sunday. Coleraine, conquerors of Ulster champions Slaughtneil following a quarter-final replay, had five points to spare against Ballinascreen who were kept at arm's length after Colm McGoldrick flicked Niall Holly's goalbound effort into the net on 23 minutes to give his side a 1-03 to 0-3 lead. That goal sent Coleraine in at half-time 1-5 to 0-04 in front, a lead was stretched to 1-11 to 0-06 as Coleraine went through the gears before a late 'Screen rally could have brought them a goal. 'Screen's Benny Heron sent one goal chance over the bar before - in injury time - Carlus McWilliams' high ball caused havoc in the Coleraine goal mouth but the goal the underdogs needed never arrived and Coleraine will advance to the decider as favourites. 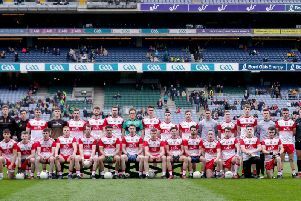 There they will meet a Lavey side managed by former Derry manager John Brennan whose magic touch in club championships continued as the Erin's Own defeated 2-11 to 1-06 in the curtain raiser. A tense, tight opening half saw the sides turn round with Lavey four points up at 0-7 to 0-3 but Declan Hughes' goal on 44 minutes provided the platform for victory. A second goal from Eamon McGill, firing home after his initial effort had been blocked, put Lavey 10 points up and meant Emmett Bradley's injury time goal was nothing more than a consolation for Glen.